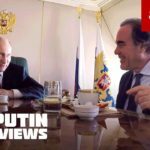 Exclusive: The U.S. political/media demonization of Russia’s Putin is unrelenting, but an interview series with director Oliver Stone poses tough questions to Putin while also letting Americans see the real person, writes Robert Parry. A new “press freedom” paradigm has taken hold in the Western world, imposing establishment narratives as “truth” and dismissing contrarian analyses as “fake news,” a break from the Enlightenment’s “marketplace of ideas,” says Gilbert Doctorow. Exclusive: To prove their chops, mainstream media stars can’t wait to go head-to-head with a demonized foreign leader, like Vladimir Putin, and let him have it, even if their “facts” are wrong, as Megyn Kelly showed and Ray McGovern explains.